Top 10 Snoring Aids - Knowledge Base - Do Snoring Mouthguards Work? 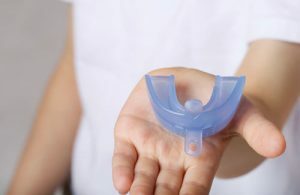 Anti-snoring mouthguards, also known as mandibular advancement devices, have long been recognized as highly effective solutions for snoring problems. In some cases, they can even be used to treat mild forms of sleep apnea. However, not every mouthguard can help every snorer and there are two major factors that need to be taken into consideration prior to opting for this type of anti-snoring aid. First of all, you need to be sure that your snoring problems are caused by oral airway obstructions. Second, you need to be careful when choosing your mouthguard, as devices that are currently available on the market differ both in terms of quality and effectiveness. Here are the crucial features that only the best mandibular advancement devices possess. Anti-snoring mouthguards can be hugely uncomfortable and equally ineffective if they do not fit right. That is why it is important that the device is well-designed and that it can be molded and/or adjusted to fit your unique mouth shape and size. Some devices employ the boil-and-bite method to achieve the perfect fit while others rely on fine-tuning or variable sizes. The best mouthguards are not only adjustable, they also come with trials and guarantees that allow you to test the device before you make a purchase. Therefore, be sure that you have selected a mouthguard that is easily adjustable and preferably, one that you can test before you invest. Never, and we repeat, never buy a mouthguard that has not been approved by the FDA. As a device that is inserted into the mouth and used nightly, an anti-snoring mouthguard must be perfectly safe to use and have a paper that confirms that it is made of medical-grade, non-toxic materials. Apart from being non-toxic, the device needs to be made of high-quality materials that can withstand repeated, nightly use for many months. As mouthguards can be expensive, it is important that the device of your choice stays effective and in good shape for a while, so you do not have to buy a new one every month or two. These are some of the most important criteria that we apply when testing mandibular advancement devices. The mouthguard that satisfies all of them and comes at a price that fits your budget is the best choice. Therefore, keep all of this in mind when choosing your mouthguard and you can be sure that what you are getting is an effective anti-snoring solution.